A heritage of the city's founding in 1781, Downtown Los Angeles today is composed of different areas ranging from a fashion district to Skid Row. 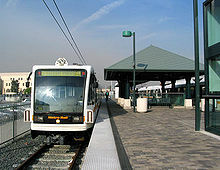 It is the hub for the city's urban rail transit system and the Metrolink commuter rail system for Southern California. Banks, department stores, and movie palaces at one time drew residents and visitors into the area, but the district declined economically and suffered a downturn for decades until its recent renaissance starting in the early 2000s. Old buildings are being modified for new uses, and skyscrapers have been built. Downtown Los Angeles is known for its government buildings, parks, theaters, and other public places. The earliest known settlements in the area of what is now Downtown Los Angeles was by the Tongva, a Native American people. Later European settlement arrived after Father Juan Crespí, a Spanish missionary charged with exploring sites for Catholic missions in California, noted in 1769 that the region had "all the requisites for a large settlement". On September 4, 1781, the city was founded by a group of settlers who trekked north from present-day Mexico. Land speculation increased in the 1880s, which saw the population of the city explode from 11,000 in 1880 to nearly 100,000 by 1896. Infrastructure enhancements and the laying of a street grid eventually brought development south of the original settlement into what is today the Civic Center and Historic Core neighborhoods. By 1920, the city's private and municipal rail lines were the most far-flung and most comprehensive in the world in mileage, even besting that of New York City. By this time, a steady influx of residents and aggressive land developers had transformed the city into a large metropolitan area, with DTLA at its center. Rail lines connected four counties with over 1,100 miles (1,800 km) of track. Commercial growth brought with it hotel construction—during this time period several grand hotels, the Alexandria (1906), the Rosslyn (1911), and the Biltmore (1923), were erected — and also the need for venues to entertain the growing population of Los Angeles. Broadway became the nightlife, shopping and entertainment district of the city, with over a dozen theater and movie palaces built before 1932. Department stores also opened flagship stores downtown, including The Broadway, Hamburger & Sons, May Company, JW Robinson's, and Bullock's, serving a wealthy residential population in the Bunker Hill neighborhood. Numerous specialty stores also flourished including those in the jewelry business which gave rise to the Downtown Jewelry District. Among these early jewelers included the Laykin Diamond Company (later becoming Laykin et Cie ) and Harry Winston & Co., both of which found their beginnings in the Hotel Alexandria at Fifth and Spring streets. The Los Angeles Union Passenger Terminal (Union Station) opened in May 1939, unifying passenger service among various local, regional, and long-distance passenger trains. 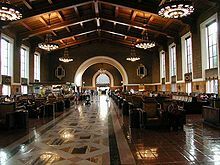 It was built on a grand scale and would be one of the "last of the great railway stations" built in the United States. Following World War II, suburbanization, the development of the Los Angeles freeway network, and increased automobile ownership led to decreased investment downtown. Many corporate headquarters slowly dispersed to new suburbs or fell to mergers and acquisitions. The once-wealthy Bunker Hill neighborhood became a haven for low-income renters, its stately Victorian mansions turned into flophouses. From about 1930 onward, numerous very old and historic buildings in the plaza area were demolished to make way for street-level parking lots, the high demand for parking making this more profitable than any other option that might have allowed preservation. The drastic reduction in the number of residents in the area further reduced the viability of streetfront businesses that would be able to attract pedestrians. For most Angelenos, downtown became a drive-in, drive-out destination. In an effort to combat blight and lure businesses back downtown, the city's Community Redevelopment Agency undertook the Bunker Hill Redevelopment Project in 1955, a massive clearance project that leveled homes and cleared land for future commercial skyscraper development. This period saw the clearing and upzoning of the entire neighborhood, as well as the shuttering of the Angels Flight funicular railway in 1969. 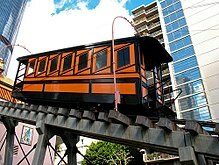 Angels Flight resumed operation in 1996 for a period of five years, shutting down once again after a fatal accident in 2001. On March 15, 2010, the railway once again opened for passenger service following extensive upgrades to brake and safety systems. With Class A office space becoming available on Bunker Hill, many of DTLA's remaining financial corporations moved to the newer buildings, leaving the former Spring Street Financial District devoid of tenants above ground floor. Following the corporate headquarters' moving six blocks west, the large department stores on Broadway shuttered, culminating in the 1980s. 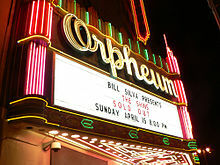 However, the Broadway theaters saw much use as Spanish-language movie houses during this time, beginning with the conversion of the Million Dollar Theater in the 1950s to a Spanish-language theater. The Wilshire Grand Center in Downtown LA is the tallest building in the U.S. west of the Mississippi River at (1,099 feet or 335 meters). It is also currently the tallest building in the state of California. In mid-2013, downtown was noted as "a neighborhood with an increasingly hip and well-heeled residential population". Because of the downtown area's office market's migration west to Bunker Hill and the Financial District, many historic office buildings have been left intact, simply used for storage or remaining empty during recent decades. In 1999, the Los Angeles City Council passed an adaptive reuse ordinance, making it easier for developers to convert outmoded, vacant office and commercial buildings into renovated lofts and luxury apartment and condo complexes. Staples Center, which opened in 1999, has contributed immensely to the revitalization plans, adding 250 events and nearly 4 million visitors per year to the neighborhood. Since the opening of the Staples Center, the adjacent L.A. Live complex was completed, which includes the Microsoft Theatre and the Grammy Museum. Los Angeles Metro Rail, a rail transit network centered on the downtown area, facilitates access to the city center, especially from the congested West Side. Real estate developers and investors planned a $1.8 billion revitalization project along Grand Avenue, which included the development of Grand Park, a large city park, and the construction of major city landmarks, including the Frank Gehry-designed Walt Disney Concert Hall and contemporary art museum The Broad, which opened in 2015. In 2009 Bottega Louie opened on the first floor of the historic Brockman Building on Grand Avenue and Seventh Street. 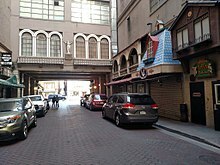 It contributed to the revitalization of DTLA by creating Restaurant Row, which has since brought numerous new restaurants and retail shops to the area. In 2012, the upper 11 floors of the Brockman Building were bought with the intention of being sold as luxury lofts. In October 2015, an outdoor lifestyle center, The Bloc Los Angeles, replaced the old enclosed Macy's Plaza. Multiple Olympic and Paralympic events will be held in DTLA during the 2028 Summer Olympics and Paralympics. Downtown skyline during sunset as seen from Griffith Observatory, October 2006. Downtown Los Angeles is flanked by Echo Park to the north and northwest, Chinatown to the northeast, Boyle Heights to the east, Vernon to the south, Historic South Central and University Park to the southwest, and Pico-Union and Westlake to the west. 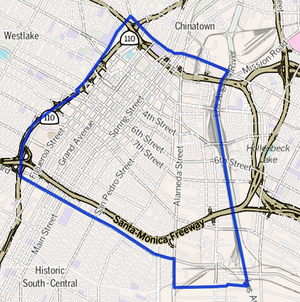 Downtown is bounded on the northeast by Cesar Chavez Avenue, on the east by the Los Angeles River, on the south by the Los Angeles city line with Vernon, on the southwest by East Washington Boulevard and on the west by the 110 Freeway or Beaudry Avenue, including the entire Four Level Interchange with Highway 101. St Vincent Court in 2017. European-style decorations date to 1957. The 2000 U.S. census found that just 27,849 residents lived in the 5.84 square miles of downtown—or 4,770 people per square mile, among the lowest densities for the city of Los Angeles but about average for the county. 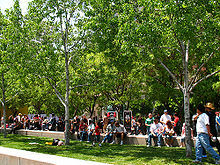 The Southern California Association of Governments estimates that downtown's daytime population is 207,440. The population increased to 34,811 by 2008, according to city estimates. As of 2014, the population of the district had grown to 52,400 residents, and 5200 residential units were under construction. The median age for residents was 39, considered old for the city and the county. Downtown Los Angeles is almost evenly balanced among the four major racial and ethnic groups — Asian Americans (23%), African Americans (22%), Latinos (25%) and non-Hispanic whites (26%) — according to an analysis of 2010 census data made by Loyola Marymount University researchers. A study of the 2000 census showed that downtown was the second–most diverse neighborhood in Los Angeles, its diversity index being 0.743, outrated only by Mid-Wilshire. The ethnic breakdown in 2000 was Latinos, 36.7%; blacks, 22.3%; Asians, 21.3%; whites, 16.2%, and others, 3.5%. Mexico (44.7%) and Korea (17%) were the most common places of birth for the 41.9% of the residents who were born abroad, about the same ratio as in the city as a whole. The median household income in 2008 dollars was $15,003, considered low for both the city and the county. The percentage of households earning $20,000 or less (57.4%) was the highest in Los Angeles County, followed by University Park (56.6%) and Chinatown (53.6%). The average household size of 1.6 people was relatively low. Renters occupied 93.4% of the housing units, and home or apartment owners the rest. In 2000, there were 2,400 military veterans living downtown, or 9.7% of the population, considered a high rate for the city but average for the county overall. In 2013, a study by Downtown Center Business Improvement District showed that of the 52,400 people resided in Downtown Los Angeles. The demographic breakdown was 52.7% Caucasian, 20.1% Asian, 17.0% Latino, and 6.2% African-American; 52.9% female, 47.1% male; and 74.8% of residents were between the ages of 23-44.The median age for residents was 34. The median household income was $98,700. The median household size was 1.8. In terms of educational attainment, 80.1% of residents had completed at least 4 years of college. The study was a self-selecting sample of 8,841 respondents across the DTLA area. It was not a "census" but rather a comprehensive survey of Downtown LA consumers. Downtown Los Angeles is the center of the region's growing rail transit system, with six commuter lines operated by Metrolink, as well as five rapid-transit rail lines and local and regional bus service operated by Los Angeles County Metropolitan Transportation Authority (Metro). Major Metro stations in the district include Los Angeles Union Station, Civic Center/Grand Park station, Pershing Square station, 7th Street/Metro Center station, Pico station, and Little Tokyo/Arts District station. The first leg of the modern Los Angeles Metro Rail system, the Metro Blue Line light rail, debuted in 1990, followed by the Metro Red Line heavy-rail subway line in 1993, the Metro Green Line light rail in 1994, the Metro Gold Line light rail in 2003, and the Metro Expo Line light rail in 2012. In late 2009, the Metro Silver Line bus rapid transit project opened, replacing two unconnected bus rapid transit lines with through service at street level through the downtown area. In 2006, a portion of the Metro Red Line was rebranded by Metro as the Metro Purple Line, a heavy-rail subway line which runs from Union Station to Wilshire/Western station in Koreatown. A westward extension of the line to Westwood is currently under construction. Metro operates an extensive bus network, including Metro Local, Metro Express commuter lines, and Metro Rapid buses with signal priority and limited stops. Los Angeles Department of Transportation operates seven local DASH shuttle lines downtown on weekdays: Lines A, B, C, D, E and F. Weekend service is operated on lines DD (Downtown Discovery), E and F.
Amtrak operates intercity passenger train service on five routes through Los Angeles Union Station: the Coast Starlight, Pacific Surfliner, Southwest Chief, Sunset Limited, and Texas Eagle. Greyhound Lines operates a major bus terminal in Downtown Los Angeles at the intersection of Seventh and Alameda streets. Los Angeles World Airports operates a direct shuttle every 30–60 minutes between Union Station and Los Angeles International Airport. The Metro Expo Line was built in two phases and completed in 2016. The first phase of the project connected 7th Street/Metro Center Station downtown with Culver City via the former Pacific Electric Railway Santa Monica Air Line right-of-way. The second phase extended the line to Santa Monica. The Expo Line shares tracks with the Metro Blue Line north of Washington Boulevard, and shares both the Pico Station and 7th Street/Metro Center Station with the Blue Line. Los Angeles Union Station is set to be a major stop on the under-construction California High-Speed Rail system, though it will not be a part of the project's Initial Operating Segment. The project would connect Northern and Southern California via the San Joaquin Valley, with service averaging 220 miles per hour (350 km/h). Under construction as of September 2014, the Regional Connector Transit Corridor will connect the Blue, Expo, and Gold Lines between the Little Tokyo/Arts District (which will be renamed "1st Street/Central") and 7th Street/Metro Center stations. Work is planned to bring streetcar-style trolley service to Downtown Los Angeles via Broadway, connecting the L.A. Live development with the Grand Avenue cultural corridor and Bunker Hill. The Water Court at California Plaza, an outdoor performance and dining space with water features, fountains, shaded seating areas and an amphitheater. Several future park proposals for the district make use of public-private partnerships between developers and the city of Los Angeles, including a public park at the proposed Nikkei Center development in Little Tokyo; a 1-acre (4,000 m2) park at the Medallion development in the Historic Core; and a pocket park at the Wilshire Grand Hotel replacement project, currently under construction. Additionally, the city recently completed a new park located on the 400 block of South Spring Street in the Historic Core neighborhood. 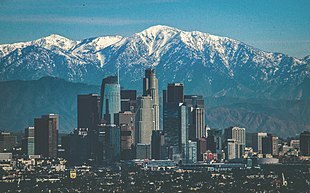 Despite its relative decentralization and comparatively new high-rises (until 1958, the city did not permit any structures taller than the 27-story City Hall building ), Los Angeles has one of the largest skylines in the United States, and its development has continued in recent years. 705 Ninth Street, a 35-story residential tower, was completed in 2009. 717 Olympic, a 26-story residential tower, was completed in mid-2008. 888 Olive, a 32-story apartment tower by Vancouver-based Omni Group, opened in 2015. Concerto, a 28-story residential tower, was completed in early 2009. A second phase (Tower II) is currently under construction. The Grand Avenue Project, designed by architect Frank Gehry, is a multi-phase project on four parcels and will include a 39-story hotel tower at the corner of First Street and Grand Avenue and a civic park. The project has been delayed due to funding issues but is now back on track and progressing. L.A. Live, a multi-phased dining, entertainment and hotel development that includes a Ritz-Carlton and JW Marriott Hotel hybrid as well as Ritz-Carlton-branded condominiums, was completed in February, 2010. Marriott International completed a 24-story Courtyard and Residence Inn tower near L.A. Live, which opened in July 2014, and plans to build a 20+ story Renaissance hotel to open in 2016. Metropolis, a mixed-use four-tower project (60, 50, 38, and 19 stories) at Francisco and Ninth streets, is currently under construction. South, a three-tower complex called Elleven, Luma, and Evo, spans the block from 11th Street and Grand Avenue to 12th Street and Grand Avenue, and was completed in phases ending in early 2009. The Wilshire Grand Tower redevelopment, a 900-room hotel and office project built in 2017, is the tallest tower west of the Mississippi River, at 1,100 feet (340 m). Figueroa Centre, a 975-foot residential and hotel tower proposed across from The Original Pantry restaurant on the Figueroa Corridor. The tower proposed will become the third tallest building in Los Angeles when completed. Angels Landing, a proposed super tall tower at 1020 ft. Currently in the funding stage. Approved by the city council in 2017. The first height limit ordinance in Los Angeles was enacted following the completion of the 13-story Continental Building, located at the southeast corner of Fourth and Spring streets. The purpose of the height limit was to limit the density of the city. There was great hostility to skyscrapers in many cities in these years, mainly due to the congestion they could bring to the streets, and height limit ordinances were a common way of dealing with the problem. In 1911, the city passed an updated height limit ordinance, establishing a specific limit of 150 feet (46 m). Exceptions were granted for decorative towers such as those later built on the Eastern Columbia Building and United Artists Theatre, as well as the now-demolished Richfield Tower. The 1911 ordinance was repealed in 1957. The first private building to exceed the old limit was the 18-story United California Bank Building, located at the southeast corner of Sixth and Spring streets. The pattern of buildings in Los Angeles to feature these "flat roofs" was the result of a 1974 fire ordinance which required all tall buildings in the city to include rooftop helipads in response to the devastating 1974 Joelma Fire in Sao Paulo, Brazil, in which helicopters were used to affect rescues from the flat rooftop of the building. 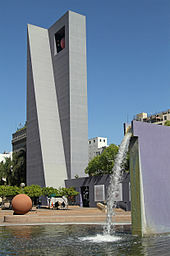 The Wilshire Grand Center was the first building granted an exception by the Los Angeles City Fire Department in 2014. However, as the building was under construction, L.A. City Council removed the flat roof ordinance as of 2015. 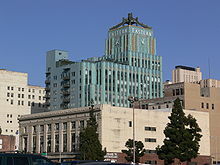 The Los Angeles County Department of Health Services operates the Central Health Center in Downtown Los Angeles. The Southern California Liaison of the California Department of Education has its office in the Ronald Reagan State Building in Downtown Los Angeles. The Federal Reserve Bank of San Francisco, Los Angeles Branch is located in Downtown Los Angeles. DTLA is a node in the tech economy that extends beyond Silicon Beach. A venture capital firm counted 78 tech-oriented firms in DTLA in 2015. This included mobile apps, hardware, digital media and clean-tech companies plus co-working spaces, start-up incubators, and other related businesses. The Arts District has become a popular spot for companies seeking out something different than typical modern offices. The central location is accessible from various parts of the Los Angeles Basin. The cultural life has also made the area attractive to young tech employees. Anschutz Entertainment Group has its corporate headquarters in Downtown Los Angeles. BYD Company, a Chinese technology firm, has its North American headquarters in Downtown Los Angeles. Downtown residents aged 25 and older holding a four-year degree amounted to 17.9% of the population in 2000, about average in the city and the county, but there was a high percentage of residents with less than a high school diploma. 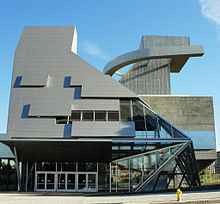 Ramon C. Cortines School of Visual and Performing Arts, LAUSD high school, 450 N. Grand Ave. Downtown Business High School, LAUSD alternative, 1081 W. Temple St.
California Academy for Liberal Studies Early College High School, LAUSD charter, 700 Wilshire Blvd. Alliance Dr. Olga Mohan High School, LAUSD charter, 644 W. 17th St.
Abram Friedman Occupational School, LAUSD adult education, 1646 S. Olive St.
Metropolitan Continuation School, LAUSD, 727 S. Wilson St.
Para Los Ninos Middle School, LAUSD charter, 1617 E. Seventh St.
Jardin de la Infancia, LAUSD charter elementary, 307 E. Seventh St.
Saint Malachy Catholic Elementary School, private, 1200 E. 81st St.
Tri-C Community Day School, LAUSD, 716 E. 14th St.
San Pedro Street Elementary School, LAUSD, 1635 S. San Pedro St.
Saint Turibius Elementary School, private, 1524 Essex St.
American University Preparatory School, private, 345 S. Figueroa St. The Fashion Institute of Design & Merchandising is at 800 S. Hope St., and the Colburn School for music and the performing arts is at 200 S. Grand Ave. Dignity Health-California Hospital Medical Center is located in the South Park district of Downtown LA at 1401 S. Grand Ave. The 318-bed community hospital has been providing high-quality care to residents of the district and its neighboring communities for over 126 years. Dignity Health-California Hospital Medical Center is known for its wide range of medical services, from women's health and maternal child to orthopedics and cardiology. The hospital also operates the only Level II Trauma Center in Downtown Los Angeles, and its emergency room treats over 70,000 patients each year. The hospital's neighbors include Staples Center, L.A. Live, Fashion Institute of Design & Merchandising and the Fashion District. The Los Angeles Police Department operates the Central Area Community Police Station in Downtown Los Angeles. ^ "Downtown LA Demographic Study 2013". DowntownLA. Archived from the original on 27 October 2015. Retrieved 3 February 2018. ^ "Pacific Electric Subway". 2000. Archived from the original on May 3, 2010. ^ "Wall Street of the West Had Its Peaks, Crashes", Los Angeles Times. ^ "Salvatore Cartaino Scarpitta, Los Angeles Stock Exchange, bas reliefs". Publicartinla.com. 1929-10-29. Retrieved 2009-06-13. ^ "Last Remaining Seats". Laconservancy.org. Retrieved 2009-06-13. ^ "Downtown LA - Page not found..." (PDF). www.downtownla.com. ^ Cara Mia DiMassa, "Downtown L.A. has gained people but lost jobs, report says", Los Angeles Times, February 21, 2007. ^ "Ordinance brings new life into downtown L.A.'s Main Street". Los Angeles Times. 2009-06-11. ^ "Facilities, STAPLES Center". AEG Worldwide. Archived from the original on 2008-08-28. Retrieved 2009-06-13. ^ Glaister, Dan (27 May 2005). "Downtown looks up: Dan Glaister reports on ambitious plans to create a brighter, better and shinier heart of LA". The Guardian. London: Guardian News and Media. Retrieved 19 July 2012. ^ a b Sharon Bernstein and David Pierson, "L.A. moves toward more N.Y-style downtown", Los Angeles Times, August 8, 2007. ^ Regardie, Jon (February 18, 2011). "The Downtowners of Distinction". Los Angeles Downtown News. Retrieved 26 March 2016. ^ Vincent, Roger (2012-04-16). "New owners turning Brockman Building into apartments". Los Angeles Times. ^ Marino, Vivian (2019-03-05). "Revitalization Projects Reawaken Downtown Los Angeles". The New York Times. ISSN 0362-4331. Retrieved 2019-03-05. ^ Wowtapka, Dawn (November 26, 2013). "In Downtown LA, a Housing Revival". Wall Street Journal. Wall Street Journal. Retrieved July 13, 2014. ^ Trounson, Rebecca (April 12, 2012). "A multicultural moment: Downtown L.A.'s population evenly split". Los Angeles Times. Retrieved April 13, 2012. ^ "Market report" (PDF). www.downtownla.com. ^ "Metro Maps". Metro.net. Retrieved 2009-06-13. ^ "Metro Rapid". Los Angeles County Metropolitan Transportation Authority. Retrieved 2009-06-13. ^ DASH Weekend Schedule Archived June 15, 2009, at the Wayback Machine, LADOT. ^ "Locations: California". Greyhound.com. Archived from the original on 2009-07-07. Retrieved 2009-06-13. ^ "LAX FlyAway". Los Angeles World Airports. Retrieved May 24, 2013. ^ "Joe Biden says California high-speed rail looking good for federal money", Los Angeles Times. ^ "Why High-Speed Trains?". Cahighspeedrail.ca.gov. Retrieved 2009-06-13. ^ "California high speed rail: Wobbling on its tracks". The Economist. 2014-04-01. Retrieved 2015-09-25. ^ "Streetcar". Bringing Back Broadway. Archived from the original on 2009-06-03. Retrieved 2009-06-13. ^ "Progress". Bringing Back Broadway. Retrieved 2009-06-13. ^ Green, Emily (2009-05-23). "LAPD green: landscaping at the new police headquarters". Los Angeles Times. Retrieved 2009-06-13. ^ "Little Tokyo looks to get back its vibes with new development". The Japan Times Online. 2008-10-10. Retrieved 2009-06-13. ^ carllehmanpi.com (2009-04-03). "Los Angeles Downtown News and Information – LA Downtown News Online > Archives > News > Korean Air Plans $1 Billion Downtown Project". Downtownnews.com. Retrieved 2009-06-13. ^ "Curbed LA: Shiny Downtown Tower Is Out, New Park Is In". La.curbed.com. 2009-01-14. Retrieved 2009-06-13. ^ "LA City Hall - Student Reader". StudentReader.com. 2012-10-24. Retrieved 2012-11-21. ^ "MerueloMaddux". MerueloMaddux. Retrieved 2009-06-13. ^ "UDR Apartments 717 Olympic". UDR.com. ^ Vaillancourt, Richard Guzmán, Jon Regardie and Ryan. "The Development Scene: The Latest Info on 88 Downtown Projects". ^ The Grand Archived April 15, 2009, at the Wayback Machine. Thegrandla.com. Retrieved on 2013-07-29. ^ "L.A. Now". The Los Angeles Times. 2009-02-10. ^ "L.A. Live". L.A. Live. Archived from the original on April 30, 2009. Retrieved 2009-06-13. ^ "404 LC : TravelAge West". www.travelagewest.com. ^ Vincent, Roger (2013-03-07). "Marriott doubles down on high-rise hotels in L.A". Los Angeles Times. 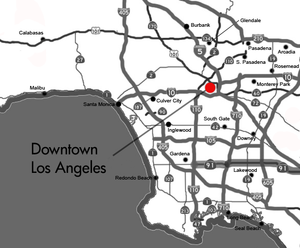 ^ "China's Greenland Buys Stake in Los Angeles Project". Bloomberg. ^ "Amid slump, one part of downtown remains hot". Los Angeles Times. 2009-04-07. Retrieved 2009-06-13. ^ "The Latest On AXS". ^ "Central Health Center", Los Angeles County Department of Health Services. Retrieved on March 18, 2010. ^ "Southern California Liaison", California Department of Education. Retrieved on December 23, 2009. ^ "FRBSF Branches", Federal Reserve Bank of San Francisco. Retrieved on March 30, 2010. ^ a b Chang, Andrea (March 7, 2015). "Tech scene takes hold in revitalized downtown L.A." Los Angeles Times. ^ Anschutz Entertainment Group Archived July 7, 2006, at the Wayback Machine. Retrieved on November 9, 2009. ^ "Contact Us Archived February 22, 2015, at the Wayback Machine." BYD Company. Retrieved on June 17, 2015. "BYD North America Headquarters Add. :1800 S. Figueroa Street, Los Angeles, CA90015, USA"
^ "2014 Annual Report 2014" (Archive). Cathay Bank. Retrieved on March 27, 2016. p. 18. "Corporate Headquarter 777 N. Broadway Los Angeles, CA 90012"
^ "Central Community Police Station – official website of THE LOS ANGELES POLICE DEPARTMENT". Lapdonline.org. Retrieved 2009-06-13. 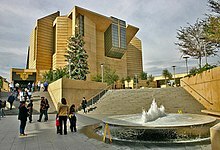 Wikivoyage has a travel guide for Los Angeles/Downtown.